If you are interested in making a donation to families listed below, please contact us! 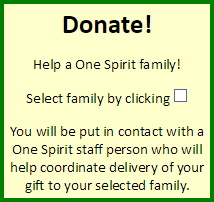 Select a family from the list (click your choice) and let us know what you would like to do. 17 4/12/2019 Granddaughter F Clothes and shoes. This young girl lost every thing in a house fire. She needs clothing and shoes urgently. She lost all her pow wow regalia in the fire. Pants; 9 junior. Shirts; 9 junior. Shoes; 9 junior. CARMELITA 68 Hygiene and paper products (toilet paper, paper towels, soap, shampoo, laundry soap). RAELENE F Large cooking pots, pans, coffee maker This family had several items stolen from them. In urgent need of help with kitchen supplies..
34 4/3/2019 Son M 5 Clothes and shoes. This little boy really needs some clothes and shoes. Its the first time this family have been on the OKINI listing. Pants. 6 to 8 years. Shirts. 6 to 8 years. Shoes. 11 little kids. BRENDA F Clothing and shoes for grandchildren. Grandparents bringing up their 3 grandchildren. They haven't asked for help since 2017, so they really do try to manage on their own ,but sometimes they need some help. 41 4/1/2019 Daughter F 9 Size 18 junior's jeans,Large leggings, XL Tops. She's big for her age, large for her age (5'5") and wears size 16 clothes and 10 women's shoes.